Welcome to the most complete hostel in Koh Phangan ! Famous the best warm up and pool parties of the island ! Only 100 meters away from the beach, and only 5 minutes drive to the walking street market, and the night food market at the main pier. We organize the best warm up parties for Half Moon Party, Black Moon Party, Jungle Experience, Waterfall party (All only 5 min close by taxi) and Full Moon Party (just 10 min by taxi). - Beer pong tournaments, with free drinks for prizes. We have over 250 beds including both dorms and private rooms, with air-con or fan, with private bathroom or shared bathroom. For every tastes and every budgets! PLEASE BE AWARE THAT WE ARE A PARTY HOSTEL & we are doing warm up party pretty much every night until 12, then we turned down the music to let those who are looking to relax get a good night of sleep. - Please note that the payment will be required in cash only on your arrival. We don't take credit card payments. 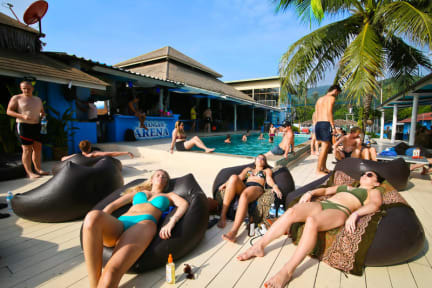 - We HIGHLY recommend you to book 3 days before to the Full Moon Party to enjoy all the major parties such as Waterfall Party, Jungle Experience and so on. -Once we received your booking we will send you an email asking you to pay the remaining balance using PayPal or a credit card. - Please not that if we do not receive the payment, we have the right to cancel the booking at any time. - Cancellation must be made at least 7 days before your arrival day. - Due to our high demand, make sure to book in advance to secure your stay. - Once the payment is done, there will not be any refund. - During our busiest time, we may be over booked. In this rarely case, the customers would be sleeping to our sister hostel which is just next door. The rooms are as good as ours! And everyone can enjoy the best of both hostels! They have everything u need, delicious food, good drinks, nice swimpool, I liked a lot! I losted my wallet days before arrive the hostel, and they did everyrhing to help me ! Thanks guys!! My friends and I spent a great time at this place! The atmosphere and entertainment areas are amazing! Clean shared bathrooms, big room with air conditioner. All perfect! Except for the Internet connection, but as the password says: talk to people is the best option! Very good atmosphere, this is definitely the place if your looking for a party hostel. It gets overpriced during fullmoon and halfmoon party, but it is still worthy if your looking for fun. Facilities and cleanliness are just average, but not a problem.